Last year I experimented with saving rainwater for irrigation. 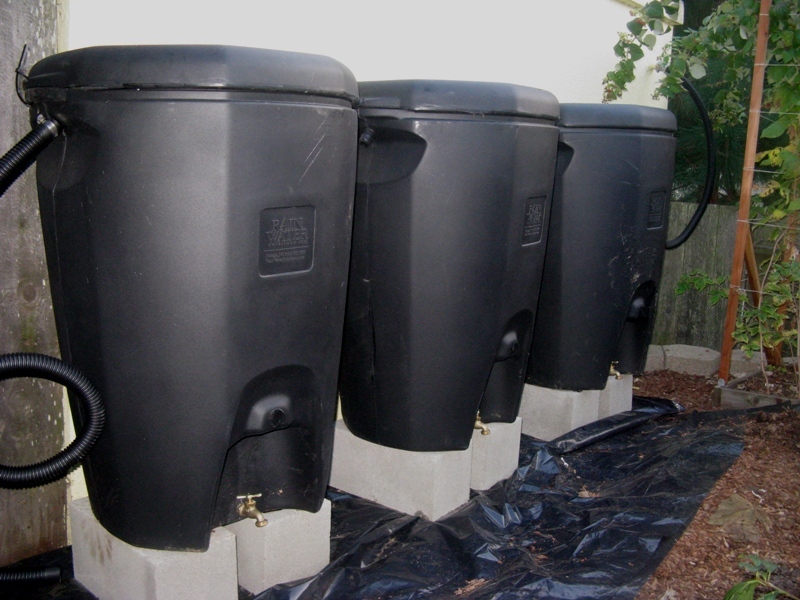 I bought four 32 gallon garbage cans and filled them up from five-gallon buckets I used as collectors. It worked, but was pretty inefficient, to say the least. However, at the end of the season, I noticed that my neighbors’ little one-stall garage, which backs up to the property line, drained into my yard. I thought it funny that I’d never noticed this before, since I’ve lived here for over 20 years. But, then, it’s only been recently that it mattered to notice. During one late spring rain shower, I put a garbage can beneath the drain spout and managed to capture two garbage cans of water in about an hour. So, inefficiency is no longer a problem! 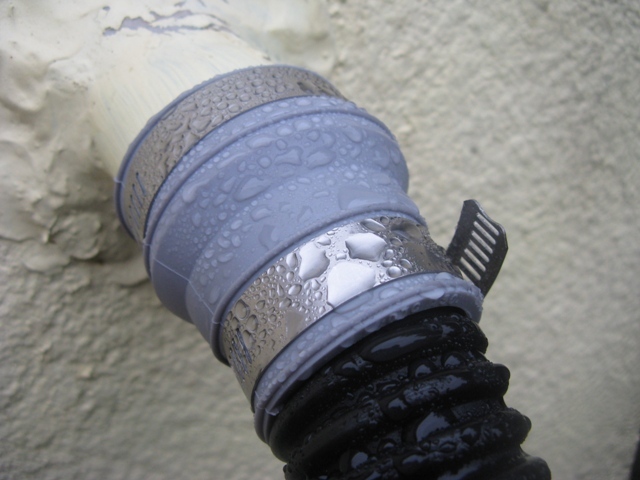 Earlier this year, the City of Oakland had a program promoting rainwater catchment, selling barrels at a discount. So, I purchased three of the 65 gallon models. (One of my Master Gardener friends bought a monster 200 gallon tank!) This week I’ve been setting them up and yesterday got most of it finished. Check the photo. On the right hand side, hiding behind the raspberry canes, I’ve connected a hose going directly from the drain off of the roof to the first rain barrel. The barrels are designed to chain together, so when the first barrel is full, it will automatically spill into the second barrel, and the second into the third. On the left side, I’ve got another hose hooked up, so additional water/spillover can be captured for storage in the garbage cans. My lucky find came yesterday, as I was figuring out how to connect the barrel’s input hose to the roof drain. I visualized what I wanted, but didn’t know if there really was such a thing. I went to Home Depot, figuring they would be large enough to have a variety of things to look at and cobble together something if I needed to do that. But, first, I explained to one of the floor staff what I wanted. He took me straight to what I needed. Not only did it do what I needed, but it was the perfect size. It’s a reducer fo connecting drain pipes of different sizes beneath sinks. Sometimes you get lucky in life! So, next year I should have over 300 gallons of rainwater for my garden, saving on city water. I won’t go into a long explanation of the advantages of water conservation, but not only does this save water, it saves energy. Water is heavy stuff and transporting it from the Sierra Nevada takes a lot of energy. So, this will be 300 gallons that the water district doesn’t need to ship to the Bay Area. Good resource page, M2. Thanks.